The curse of the humble wine enthusiast is this: as your appreciation for good wine grows, the cost to obtain “good” wine rises. As much as I would enjoy drinking fine Napa Cabernet or French Bordeaux every night, I am more than likely drinking a solid bargain wine instead. And that, in a nutshell, is why I do this blog every week: to share these wines with you! South America is a paradise for really excellent, but still affordable, red wines. Chile, in particular, has become one of my go-to regions for good Cabernet Sauvignon. Concha y Toro is a mass producer of decent low-cost wines, but they also produce quality single vineyard wines that highlight Chile’s diverse wine regions. The Marques de Casa Concha, for example, is a very fragrant Cabernet Sauvignon that is ranked annually in the Top 100 Wines of the Year by Wine Spectator. The 2014 has pronounced floral and bell pepper aromas with a whiff of blueberry and stewed apple. This is an incredibly smooth wine, with subtle flavors of blackberry, tart cherry, and olive, and a long peppery finish. You can taste the oak aging with notes of cedar and smoke, but it’s not overpowering. 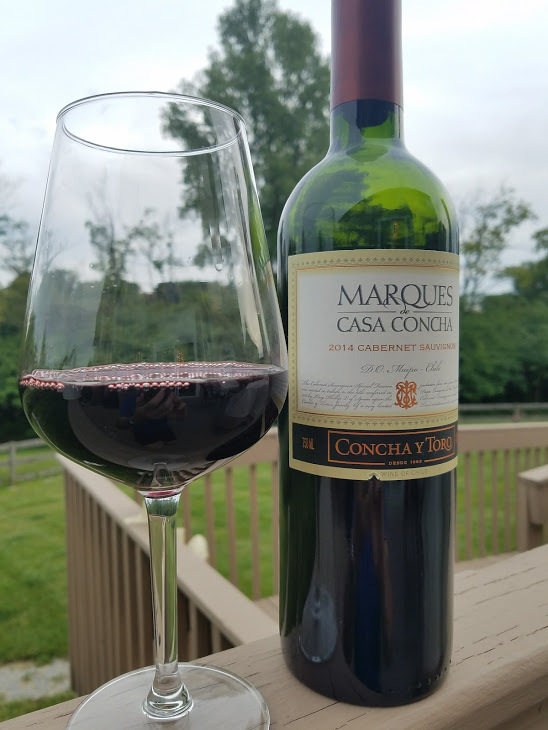 If you’re looking for a fine Cabernet Sauvignon that drinks more expensive than its $18 price tag, the Marques de Casa Concha fits the bill! On my five-cork scale based on taste and value, I give the 2014 Marques de Casa Concha Cabernet Sauvignon four corks. If you’d like to try interesting wines like this, please join me at our next private wine party at The Party Source! I host a wine dinner there every month with sommelier Steve Tartaglia, and we feature four interesting wines, paired with a delicious catered dinner from Kate’s Catering and Personal Chef Services. There are always cool prizes to win, too, so listen Wednesday at 4:15 to win your spot on the guest list, or click here for a chance to win!